We shared five tips for making sure that your fastening was done correctly, now here are five more to help you operate better. The benefit of investing in higher quality products that have been measured and tested is that you can feel confident in what you’re putting into your finished good. 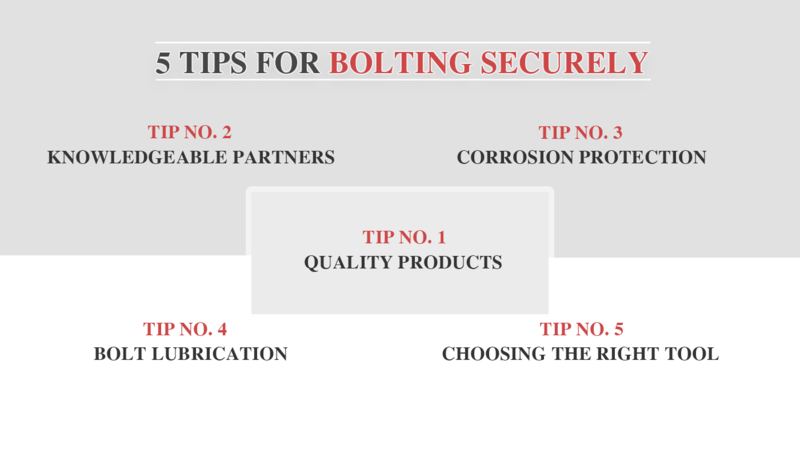 With bolting solutions you get what you pay for. While there are certainly cost control measures to consider making sure you aren’t cutting corners when it comes to your fastening will save in the long term on reliability and reduced maintenance/repair costs. There are thousands of fastening solutions available from a wide variety of suppliers. But how can you be sure that even components that are widely used are appropriate for your specific temperature, pressure range, or needs? Finding partners to help you achieve high material reliability and the right choice of fastening is crucial. The cost of a recall or the damage to a brand can be significant. When you read about an accident caused by a ventilation system leaking, or an engine failure, or any number of things, we wonder if it may have been because the company chose the wrong fastening solution. Achieving high quality is about working with partners known for their expertise, who will prioritize quality over making a quick profit. Corrosion is an ever-present threat when it comes to metal. Any metal product derived from iron or steel will eventually rust and disintegrate when it comes into contact with oxygen and water. The good news is that there are ways to arrest its progress. One method is cathodic protection, which involves using a metal such as zinc as the anode to maintain the integrity of the covered metal. 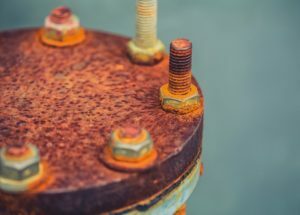 Depending on the specific needs of your application Martin can recommend methods to control or prevent corrosion. Learn more about how Martin helps our customers. Reusing fasteners is more convenient than carrying around replacements of various sizes and grades throughout a plant or out in the field. Plus, it is less expensive. However, it is hard to know if used fasteners have been damaged and could fail. 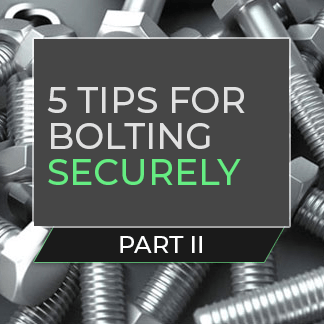 Be sure to give any bolt you’re planning to reuse a thorough visual inspection. If you see signs of corrosion, avoid reuse if possible. The same goes for visible thread damage. But there may be times when you have no alternative but to reuse a damaged bolt as a temporary solution. If you have to reuse, then lubricate. It provides a degree of protection against corrosion. And if you have a damaged thread, lubrication will help achieve the clamp load you require until you’re able to install a new bolt. The capacity of a bolted joint is determined by the preload level. So to ensure that your joint will not fail it is important to know the preload level required and then to achieve it through a suitable tightening method and a proper tightening sequence. It is also important to differentiate between the static and dynamic capacity of a screw. A typical screw can withstand a high static load, but only a small amount of dynamic load. Therefore it is important to have a high preload to reduce the effect of dynamic working loads applied to the joint. When tightening, it is important that you choose a tool and a tightening sequence that enable you to achieve the preload that the design engineer has specified. Martin Fastening Solutions has the experts in providing complete solutions for bolted joints including design, product selection and on-site support. Learn more about them here or Contact Us today to get started.